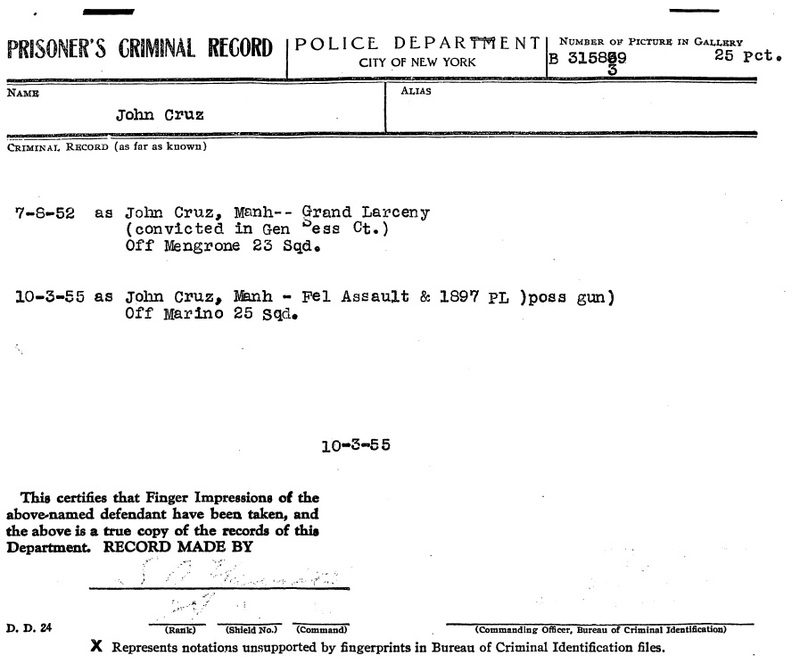 You would think that the NYPD would have a treasure trove of documents, reports and photos on youth gangs from the 1950s, especially on gang killings. I have been asked by people what I was able to access for my research in regards to the NYPD. It is a legitimate question and one of the first I asked myself. Seeing mug shots from Eric Schneider’s book Vampires, Dragons and Egyptian Kings of Salvador Agron and Luis Hernandez only strengthened my desire to see what the NYPD had. My first foray into requesting information from the NYPD did not begin well and my first request did not get any results whatsoever. 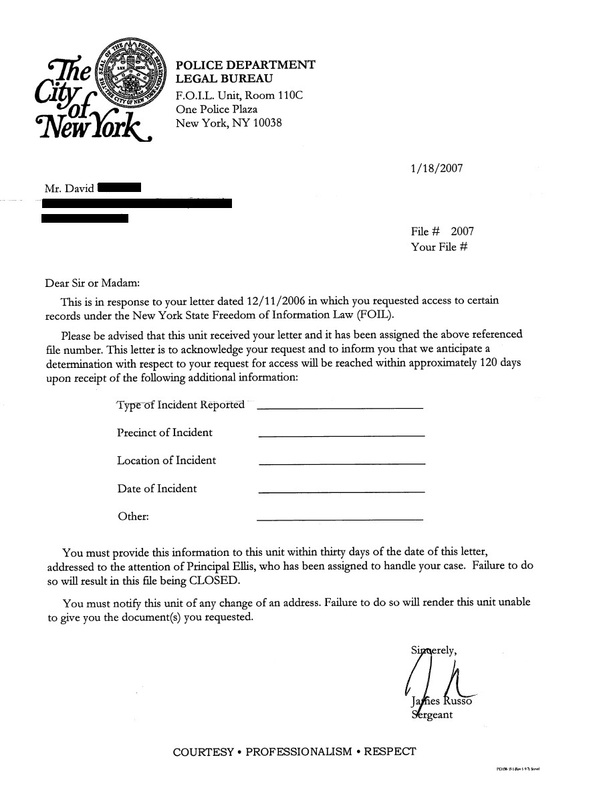 My eagerness to see NYPD documents was further accentuated when I went to the Municipal Archives in 2007 and found New York police department documents scattered amongst the case files I was researching. I found documents like mug shots, finger print cards and NYPD Prisoner’s Criminal Records, shown below. 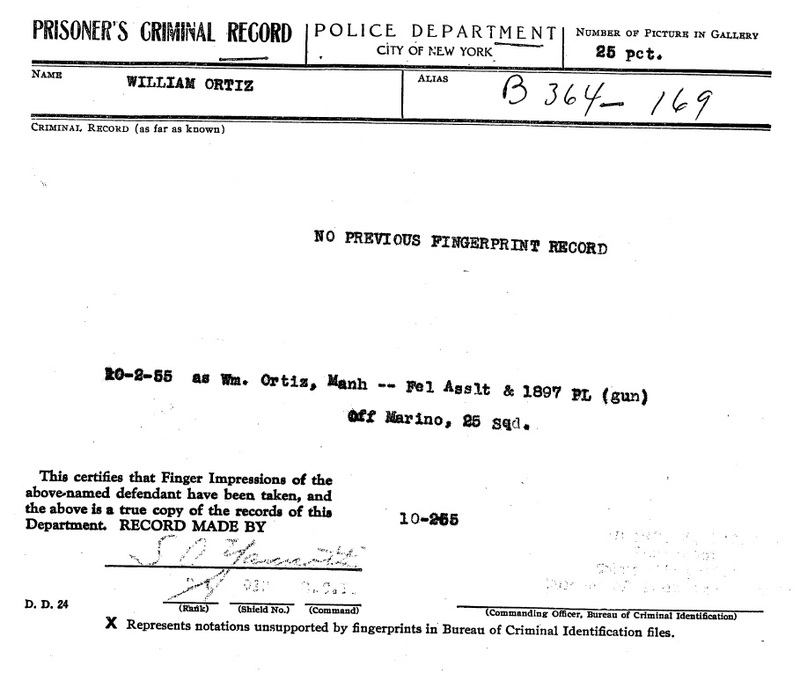 Two Prisoner’s Records, one for John Cruz, the other William Ortiz. Cruz and Ortiz were members of an East Harlem gang called the Demons. In 1955 they drove into Viceroy territory, also from East Harlem, to avenge a beating administered to one of the Demons. They got into a shoot-out with the Viceroys from their car. Cruz and Ortiz shot Villard Santos, a Viceroy, in the leg. But the Viceroys struck back, shooting and killing Pablo Pizzarrow, a Demon who was driving the car. My first request in 2005 had dismal results, I did not understand the process of making a Freedom of Information Request which I believe hurt my chances (although it shouldn’t have according to the regulations of that Act). For my second try I researched Freedom of Information Act requests and how to go about doing them. I also emailed Robert Freeman who is the Executive Director of the Committee of Open Government, an agency that deals with the whole idea of FOIL requests. My concern was that I would be requesting documents from the NYPD that are not allowed in the first place. His reply was helpful and after reading it I knew that I should be able to request information from them without having my request being rejected out of hand. I also found a helpful form letter in which I could make a Freedom of Information Request which is found on their website. The NYPD also has a page devoted to making FOIL request with them which I might use in the future. At this point I am still going through the cumbersome process of requesting documents from the NYPD, although to be completely honest I haven’t requested anything recently and have not received any documents or photos to this point. Just writing this page is making me want to try the process again. I have a feeling I won’t get anything from the NYPD because of their bunker mentality but I want to make sure I did my best before closing the book on them. A reader sent me this riveting photo of a policeman brandishing his weapon. 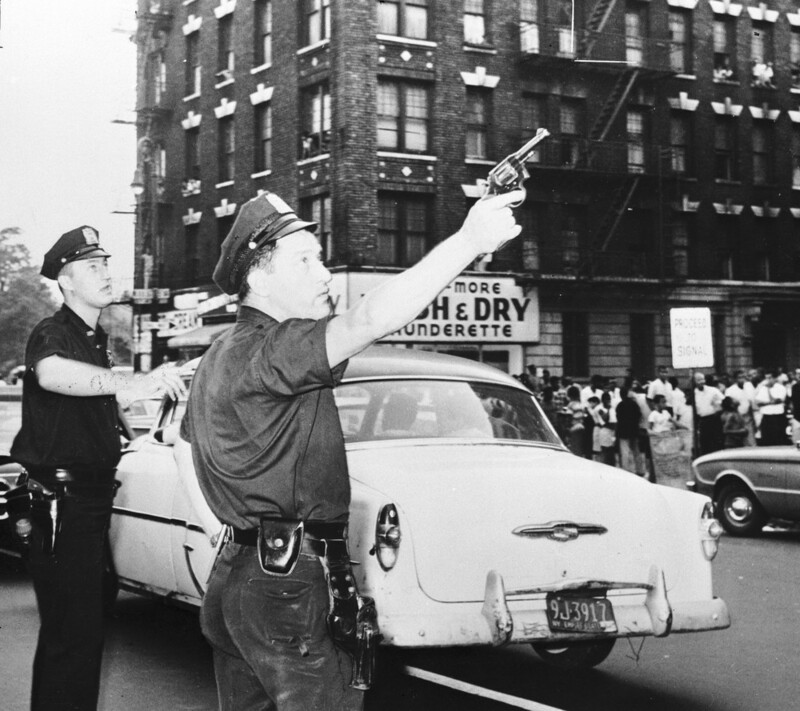 This was taken in November 1961 and the only information provided is that these two members of the NYPD were in the act of pursuing members of a gang after a fight broke out.